Do you want to make a difference in the lives of those you love and those of future generations? Today is your opportunity to begin to create your Spiritual Legacy through your Faithbook. 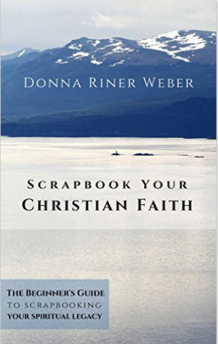 Discover the Secret to Scrapbooking Your Christian Faith. Learn why it’s important for a Christian to leave a spiritual legacy for their loved ones as you discover the secret to scrapbooking your faith. Imagine for a moment that God has called you to Heaven. Close your eyes. Visualize the future. You are no longer present here on planet earth. Your shoes sit empty. Your chair at the table is now occupied by another person. Pretend that in this future scene you can see your family sitting around the kitchen table sharing memories as they look at your scrapbook. Those you left behind are about to read the message you left. What does your Legacy Say? Numerous verses of the Bible instruct us to tell our children about God’s faithfulness to us. What could be a better way than to paste spiritual messages beside pictures of your loved ones in your scrapbook? What kind of spiritual message are you leaving for those who will follow you? Do you have lots of stories you want to share? Do you like to write poems? Is your specialty writing letters of encouragement? Have you prayed special scriptures for your children or your grandchildren? Don’t worry if you feel that you’re not an eloquent writer. You may choose to use scriptures for now. You can choose one main way to pass on your message or—you may make it eclectic like mine. I use whatever method I feel inspired to use on any given day. There is neither a right nor wrong way to scrapbook your faith. Pray about your vision for your Faithbook. Take it one layout at a time. •	Layout: the arrangement of elements on a page in a scrapbook. A layout usually consists of a title, photos, journaling and other embellishments which carry out the theme of the page. This is usually completed on one page or two pages in which the same thought and design continues from one page to the other. Who do You Want to Receive Your Faithbook? When reflecting on the vision for your Faithbook, determine who you want to receive this spiritual keepsake. Will it be your spouse, your children, grandchildren, special friend or a church group? The Bible tells us that “where there is no vision, the people perish.” Proverbs 29:18 (KJV). It may be your own Faithbook that plants a seed of hope as your great grandchild suffers through a chronic illness or the loss of someone she loves. It might help lead one of your descendants to accept Jesus as his Lord and Savior. You may not ever get to meet this child but maybe he/she will get to know you and more importantly your faith and relationship with God. •	Faithbook: a scrapbook which shows God’s presence in the lives of the scrapbook artist and/or the people showcased within the album. In scrapbooking your faith or “Faithbooking”, Christians often choose to reveal more about themselves. Sometimes, they disclose more “heart moments” through some tough and sad times. Those happy times and celebrations of birthdays, anniversaries, and various holidays are also an important segment of the Faithbook. Life seems to be more inclusive. It’s like “reality scrapbooking”—the good and the bad, the pretty and the ugly. sharing your heart moments of God’s presence in your life. So now you know the secret of scrapbooking your faith is found within you—but is it really worth it? You know that Faithbooking benefits your readers but what about you? In Chapter two find out what’s really in it for you. Scripture marked (KJV) are taken from The Holy Bible Authorized King James Version Copyright 1994 Broadman and Holman Publishers. Used by permission. All rights reserved. Scripture marked (TLB) are taken from The Living Bible ©1971 Used by permission of Tyndale House Publishers, Inc. Wheaton, IL 60187. All rights reserved.